This last of three clippings we found from 1895 editions of the Racine Daily Journal is the longest. 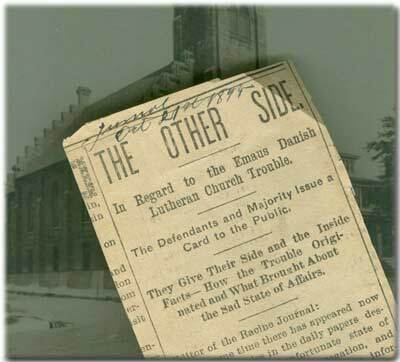 In the letter, printed on October 21, the “majority faction” of what was then called Emaus Danish Lutheran Church responds to earlier reports of an injunction filed against it by the “minority faction.” The split would result in the founding of Our Savior’s and Bethania Lutheran Churches, and the departure of Rev. Nicolai Viggo Holm to be pastor of the former. For some time there has appeared now and then articles in the daily papers describing the very unfortunate state of things inside of our congregation, and we have reason to believe that the information thus gained has been obtained from very partial sources, we desire hereby to state our, the majority, side of the case, to the impartial public. The strife which has for years existed between the two factions in the association of some of the Danish Lutheran churches of America, has not been felt to any extent in our congregation until about two years ago, when the above named association, to which Emaus congregation then belonged, held its convention here in Racine, and when a new constitution was adopted, also new officers elected, composed of people of only one of the two factions. The new constitution recognized as highest authority a board or standing committee of the Lutheran church of Denmark, consisting of laymen and ministers who had originally started the mission among the Danish people in America by sending ministers and missionaries over here and in other ways assisted in the mission work. At the close of the Racine convention, when only a few were present, a motion was adopted to have the new constitution signed by the different congregations belonging to the above referred to association within a specified time, namely Feb. 15, 1894, and those that did not wish to sign would be considered as expelled from the association. Meanwhile the standing committee in Denmark, mentioned above, in order to restore harmony and good will between the two opposing factions within the association, submitted certain demands or rules for the officers and association to comply with, the obedience of those rules being a condition for its committees, future assistance and existence. These rules were not complied with, and the result was that the committee dissolved, and the connection with the mother church in Denmark was disrupted. From now the trouble began in our congregation. At a lawful meeting held Jan. 8, 1894, of Emaus congregation, a vote was taken in regard to signing the constitution, which resulted in 41 votes for signing and 86 against, the majority wishing connection with the mother church. The minority, who wished to sign the constitution, has since that time been dissatisfied, although the congregation has, contrary to what they, the minority, have said and written, (as for example in the complaint) shown them every consideration and never denied them the right to express themselves upon any subject and have allowed them to call ministers of their own faction to preach in the church except in one case lately, when a certain minister was denied the pulpit, as the majority of the congregation considered him one of the originators of the present strife. The growing discontent led to the congregation holding a meeting on Sept. 29, and continued Oct. 7, to take under consideration the question: “Can the opposing factions work together any longer to the benefit of themselves and the congregation.” The congregation and also the plaintiffs manifested unanimously that they did not believe they could. Then the question came: “If we cannot work together, can we then not part peaceably and divide fairly so that each side get their share.” A vote was taken which resulted in 87 for peaceable division and none against. We will here state that we have repeatedly and earnestly endeavored to persuade them to accept our offer, but in vain, and you all know the result as it has been published. The charges preferred against us in general and against Rev. N. V. Holm, our pastor, in particular, we consider without foundation, unjust, and uncalled for–not to use stronger expression–but as this is not the time and place to answer each of them separately, we will leave it for our accusers to prove them when the proper time comes, and will leave it for the impartial and fair minded public to judge who is to blame for this sad state of affairs within our congregation. To illustrate the true feeling within our congregation in regard to this matter we shall simply present the result of a vote taken last Friday night to consider how many were on each side. It proved to be 112 for the defendants; 7 for the plaintiffs; 67 were not present, two refused to vote. This portion of our history is covered within the second page of our History section. See also the Wikipedia entry concerning the theological basis of this dispute.